This rheumatic disease chart shows the anatomy of this disease in colorful detail. 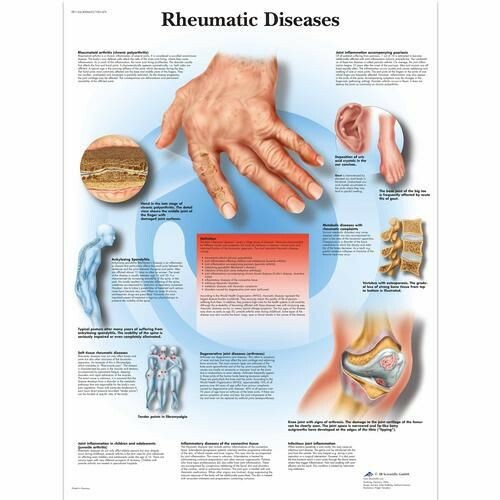 Other useful information about rheumatic disease is included on this anatomy poster. This thickly laminated anatomical chart is printed on premium glossy (200 g) UV resistant paper and comes with 2 sided lamination (75 micron). It comes in a convenient poster size 50 x 67 cm (20x26'') and can be written on and wiped off with non permanent markers. The 125 micron lamination ensures the rheumatic diseases poster does not curl up at the edges and the UV treatment ensures the poster not get a faded yellow color over time.